The greater white-fronted goose (Anser albifrons) belongs to the family of duck, goose and swan, the Anatidae. 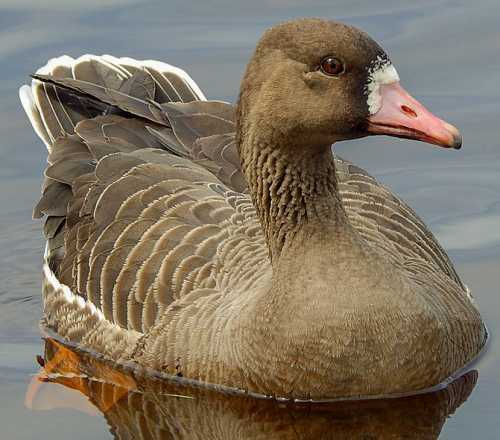 The greater white-fronted goose is distributed in North America, Europe, Asia, Indian subcontinent and parts of the Middle-East. The goose species is fully migratory. This goose is polytypic species. The greater white-fronted goose (Anser albifrons) is a large-sized goose, measuring 65 to 85 cm in length and weighing 1800 to 3600 grams. The wingspan is 130 to 160 cm. The greater white-fronted goose has overall grayish brown plumage. The face, throat and upper breast are paler. The brown tail has whitish fringe. There is dark striation on the neck and breast. The lower belly and undertail are whitish. There is a whitish patch of feathers at the base of upper beak. The belly region has blackish blotches. The pale pink bill has pale gray tip. The legs and feet are orange. The irises are blackish. There is a pale gray eye-ring. Their call is a repeated "quak.. quak" or "queek.. queek" sound. 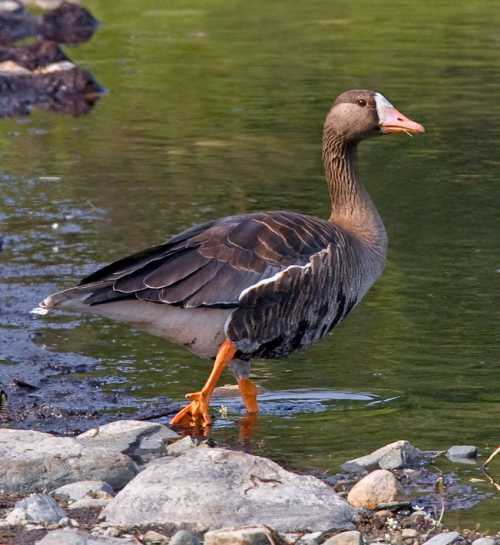 The greater white-fronted goose is distributed in North America, Europe, Asia, Indian subcontinent and parts of the Middle-East. The nominate greater white-fronted goose subspecies A. a. albifrons is distributed in north Russia (from Kanin Peninsula to Kolyma River). This subspecies winters in Europe, southwest Asia, Indian subcontinent and eastern China. The goose subspecies A. a. frontalis is distributed in eastern Siberia (Russia) Alaska (USA) and Arctic Canada. This subspecies winters along Pacific coasts of China and southern North America. The greater white-fronted goose subspecies A. a. gambelli is distributed in north and central Alaska and northern Canada. It winters in southwest USA and Mexico. The subspecies A. a. sponsa breeds in southwest Alaska and winters in California and west Mexico. 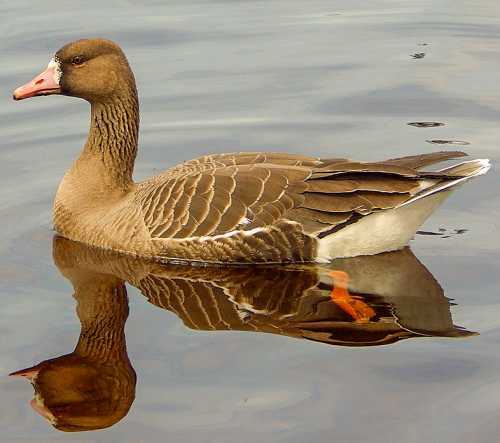 The greater white-fronted goose subspecies A. a. flavirostris breeds in western Greenland and winters in British Islands. The subspecies A. a. elgasi breeds in southern Alaska and winters in California. The Important Bird and Biodiversity Areas (IBA) of the greater white-fronted goose in USA are, Quivira National Wildlife Refuge, Iditarod River Lowlands and Coastal Prairie. The IBA of the goose in Canada are, Rasmussen Lowlands, Queen Maud Gulf, Beaverhill Lake, Plum Lakes Area, Galloway and Miry Bay, Mackenzie River Delta, Hay and Zama Lakes, Luck Lake and Kugaluk River. The IBA of the greater white-fronted goose in Greenland are Naternaq, Itsako, Itinneq, Eqalummiut Nunaat-Nassuttuup Nunaa and Aqajarua-Sullorsuaq. The IBA of the goose in China are Yellow River Delta Nature Reserve and Dongting Hu wetlands. The greater white-fronted goose species do not normally occur in forests. They normally occurs in altitudes between 0 to 2500 meters. The artificial ecosystems and habitats of these species include agricultural fields and pasturelands. The natural ecosystems and habitats of these species include tundra grasslands, tundra wetlands, steppe, wet meadows, marshes, swamps, peatlands, estuaries, tide pools, marine lakes and coastal freshwater lakes. The diet of these greater white-fronted goose species consists mainly of plant matter. Sedges, grasses, roots, stems, leaves, shoots, sprouts, seeds, berries, grains and cereals are their primary food. The breeding season of these greater white-fronted goose species is during May and June in most of their breeding range. These birds are monogamous and nest solitarily or in small groups. The nesting sites include low-lying, shrubby tundra, close to marshes, lakes, pools or rivers (del Hoyo et al. 1992). The nest is constructed with plant matter on raised hummocks or slopes. These greater white-fronted goose species are fully migratory birds. The breeding populations are found in Arctic and subarctic North America, Europe and Asia. They migrate to the wintering grounds in August and September. These species reach the breeding grounds in early Arctic summer. They travel in stages through several stop-over sites during their movements between breeding and wintering grounds. The global population size of the greater white-fronted goose (Anser albifrons) is estimated at 3,100,000 to 3,200,000 individual birds (Wetlands International 2015). The overall population trend of the species is not known. In most of its range, this species is reported to be common to locally common. The generation length is 11.3 years. Its distribution size is about 19,200,000 sq.km. Ecosystem degradation, ecosystem conversion, severe weather, climate change, sport hunting and trapping of juveniles and adults for pet-trade are the main threats that may endanger the survival of the goose species. The greater white-fronted goose (Anser albifrons) species does not approach the thresholds for being Vulnerable either under the range size criterion, or under the population trend criterion or under the population size criterion. The CITES (Convention on International Trade in Endangered Species of Wild Fauna and Flora) status is ‘Not Evaluated’ for the greater white-fronted goose (Anser albifrons). The greater white-fronted goose (Anser albifrons) is closely related to the Anser erythropus. A. a. sponsa Banks, 2011. Recently updated and current topic in Bird World: Greater white-fronted goose - Anser albifrons.